Is your cat coughing and gagging all the time? There are a number of effective hairball remedies for cats that can make life easier for both of you. Has your cat ever started "barking" at you? It's not a true bark, but more of a hacking cough, usually accompanied by heaving shoulders and a hunched back, very often caused by a hairball. What is a hairball? A hairball is just what it sounds like -- it is a ball of hair. They are often caused by the cat grooming itself, and can be seen more often in the spring and less often in the fall, during the primary shedding seasons, though they can happen any time of year. Are they dangerous? Not usually. Sometimes they are small enough for your cat to spit or vomit back up. However, some can make a cat constipated if they are so large and are hard for a cat to pass easily. A hairball is made up of fifteen to thirty percent protein and the enzymes in a cat's stomach are not strong enough to dissolve the hairball, so sometimes you need to help the process along. 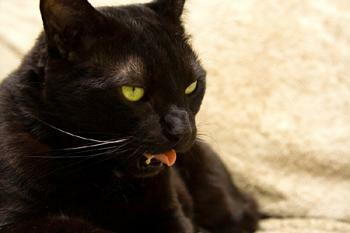 Usually the problem can be dealt with just by lubricating your cat's intestinal tract to ease the way of the hairball. You can use a commercial remedy like Petromalt or Laxatone, but I have several natural remedies that will work and won't cost a trip to the pet shop. Feeding your cat a bit of butter or margarine can do the trick, or you can use a dab of petroleum jelly on their nose. One teaspoon of mineral oil will also work, and you can also feed about one-quarter to one-half a teaspoon of mineral oil every couple of weeks, as a preventative measure. Another good remedy is to feed your cat some kind of fiber. Try vegetables -- they are a good source of fiber and will help the hairball pass. For those of you who have cats that won't go anywhere near vegetables, another way to add fiber to your cat's diet is by growing them some oat or wheat grass. Not only will it keep them away from your houseplants, some of which could be toxic for them, but they also love to chew on it. It adds a natural form of fiber, won't hurt them, and it will help the hairball pass naturally. You can place it in one of their favorite inside spots, like near a sunny window, or if they have a favorite place to lie outside, you could put it there.